In two weeks time it’s the Monaco Formula 1 Grand Prix. 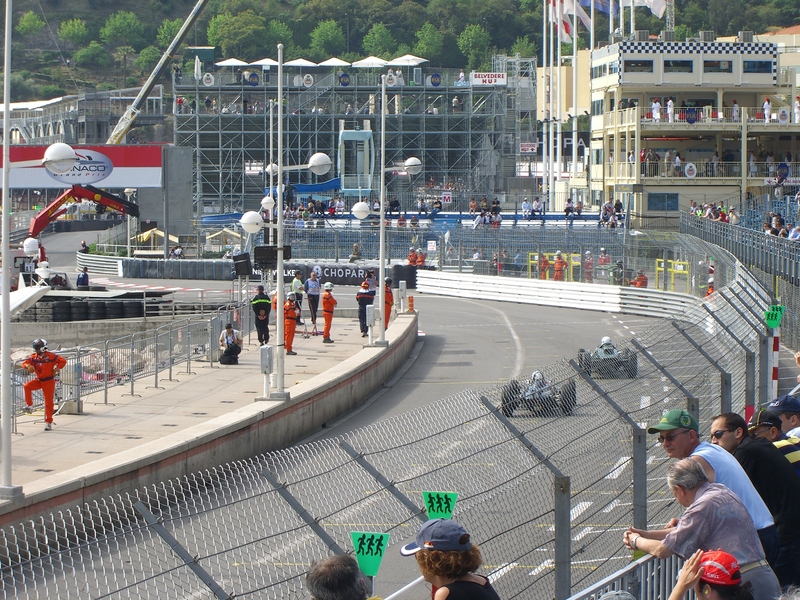 This weekend Monaco hosts the biennial Historic Grand Prix, where they wheel out racing cars dating back to the early part of last century and race them around the circuit. We turned up today for the cheaper of the two days. The day’s programme is run twice – before and after lunch – allowing two sets of visitors to enjoy the same show. The day was sunny but not uncomfortably hot; perfect conditions for sitting in a grandstand. Ours turned out to be right next to the port, on the first bend after the chicane. There were half a dozen or so “races”, each featuring a group of cars from a decade or so of Grand Prix history, making it more balanced – and safer – than allowing a modern Formula 1 car on the circuit at the same time of one of its wheezing ancestors. Each of the races moved the historical marker forward a decade or so, and as the speeds increased so did the noise level. I’ve never attended a proper Grand Prix and now I probably never will; I have too much respect for my hearing. The term “ear-splitting” is truly accurate and describes well the crackling sensation bordering on pain as the cars pass. The loudest noise of all was reserved for a parade of Ferraris, old and new. One of the earlier races featured the legendary Stirling Moss, driving a replica model of one of the cars in which he made his name. Sorry I can’t be more specific but I didn’t buy a programme and the PA system, though itself loud, was in four languages and frequently drowned out by the sound of the cars. Here’s a short video clip showing Stirling passing our grandstand. The port area of Monaco is ringed with apartment blocks, and of course the yachts themselves offer ringside seats. So although the grandstands were well filled I was a little surprised not to see many people watching from their balconies. I suppose if you live there you get blasé about it after a few years. Or perhaps they’re only interested in the ‘proper’ Grand Prix in two weeks time.